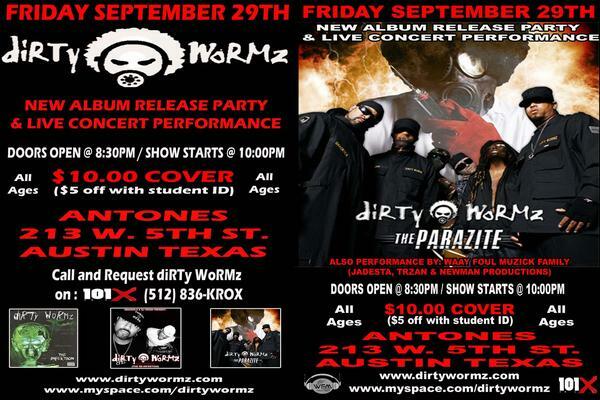 Dirty Wormz will be at Antone's on Sept. 29th for their CD release party. Tix are $10. Smooth flow hip hop rhymes, with a beat like a punch to the gut. That's what has brought diRTy WoRMzfrom its experimental roots in 2001 to the evolving monster it is today. Originally started in 2001 as a rap/rock collaboration between Smackola, DJ Crash, and the Vallejo brothers (from the legendary Austin TX band of the same name), the band eventually begged, borrowed and stole the people they needed to make this twisted dream a reality. 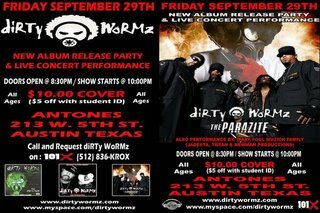 diRTy WoRMz debut CD The Infektion brought together a who's who of Austin musicians under the direction of producer Dwight "Dwizza" Baker. The CD has shown consistent high sales over several years of release, helped earn the band the Best Hip Hop award two years running at the Austin Music Awards, and produced a local radio hit in "Top Of The Food Chain". Meet the players -- and playas -- who brought this dangerouz beast to life!